Nothing is more important than what you keep in your heart. Our selection of heart necklaces includes hundreds of designs featuring the widely known symbol of love. These personalized heart necklaces are designed for a wide range of recipients and occasions. Sending or giving gifts is a good way to show your loved ones how much they mean to you. Regardless of the the occasion, Limoges Jewelry has the perfect gift items you need. Looking for something special for your anniversary? Give her a personalized heart necklace. We also have necklaces for couples and those who need something for their friends or moms. 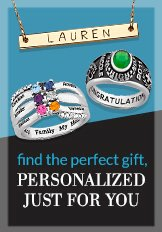 We can engrave the recipient’s name on the necklace for a more personalized look, as well.